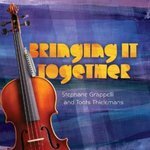 "Bringing It Together (CD)" by Stephane Grappelli, Toots Thielemans et al. CEI Records, Cymekob Enterprises Inc. Copyright 1984 CEI Records, Cymekob Enterprises Inc. Recorded May 1984 at Russian Hill Recording, San Francisco. Bye bye blackbird -- Just the two of us -- Fifty ways to leave your lover -- Georgia on my mind -- Jitterbug waltz -- You'd be so nice to come home to -- Hit the road Jack -- Limehouse blues -- As time goes by. Grappelli, Stephane; Thielemans, Toots; Taylor, Martin; Torff, Brian Q.; and Fosset, Marc, "Bringing It Together (CD)" (1984). Visual & Performing Arts Faculty Music Gallery. 20.